The TRIPS Travel Time system is a sophisticated facility that directly integrates with, and provides accurate Travel Time Prediction, information on Road Network Performance, Traffic Queue Prediction, and other important information on roads controlled by the SCATS(*) Adaptive Traffic Management System. Today’s demands on the road traffic network are higher than ever, and drivers need to make informed decisions on their travel requirements. Escalating fuel costs have placed further pressure on road authorities to ensure that drivers travel both more effectively and efficiently. Furthermore, informed choices on the use of motorways or arterial roads requires the availability of up to date traveller information. 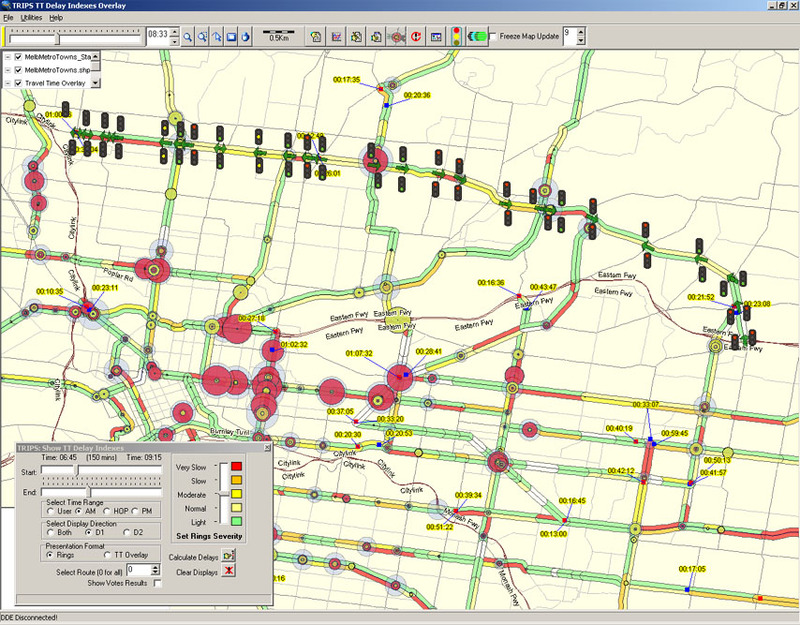 TRIPS provides all of the necessary tools for road authorities to make this data available via a completely automated package. This assures that TRIPS outputs are always consistent with current road demands. The TRIPS Travel Time System incorporates a sophisticated map-based Graphical User Interface providing traffic engineers and operators with road travel time information in a streamlined and intuitive format. TRIPS can provide timely and reliable predicted travel time information to traffic engineers, radio broadcasters and optionally to roadside displays on roadways throughout the entire arterial traffic network. Distributed Data System shares data across multiple users. 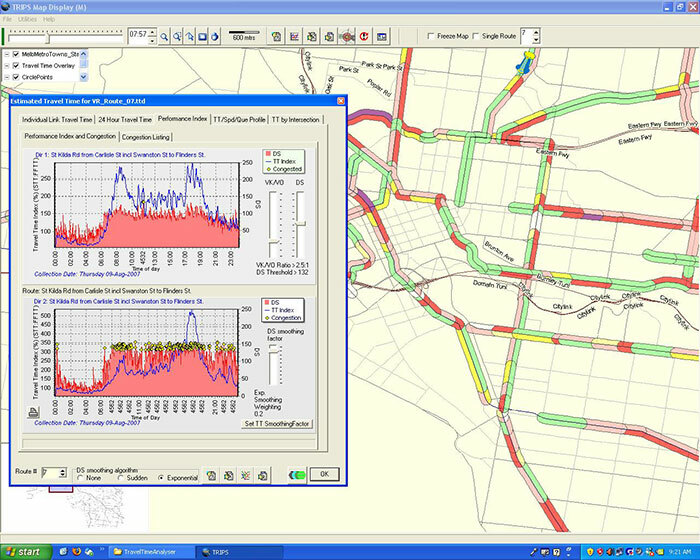 The TRIPS Travel Time system presents detailed graphs, allowing traffic engineers to instantly evaluate road performance of not just predicted Travel Time, but many other important facilities as well. 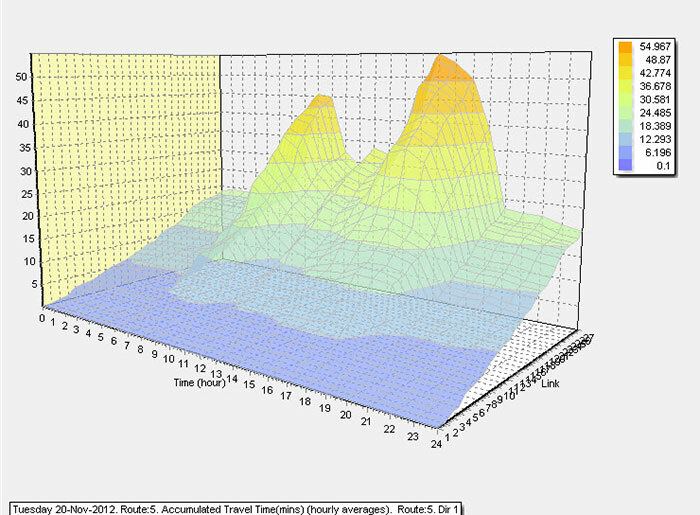 Graphs are available that show individual link travel times, allowing problem sites to be quickly identified. TRIPS can work in realtime, and can optionally store data from more than 8000 sites for later retrieval and analysis. 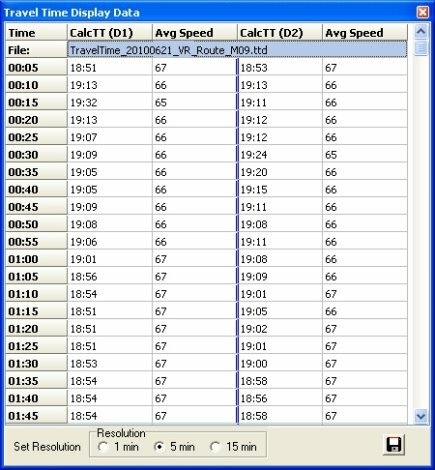 Additionally, TRIPS can retrieve historical data from SCATS at any time, even data that has not previously been used to provide travel time prediction. This flexibility means that traffic engineers can compare current travel time and performance data to that of 12 months or even several years. 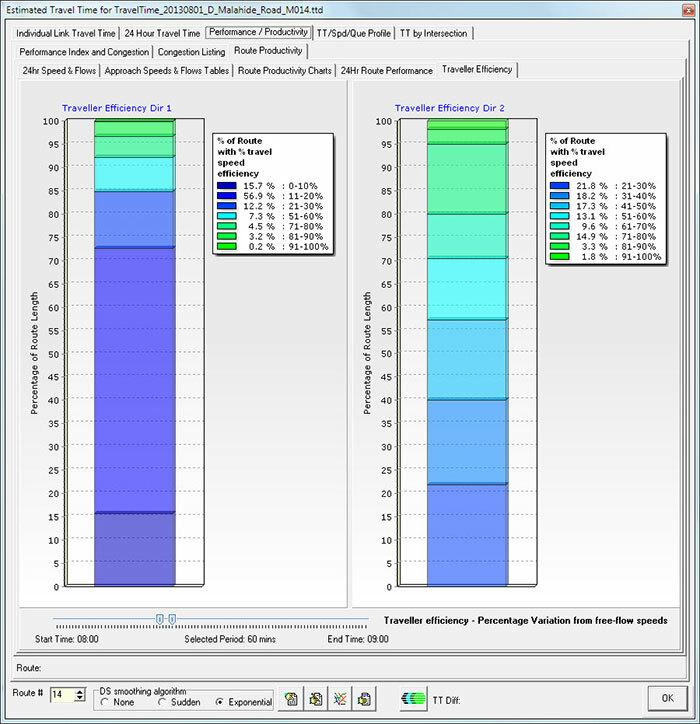 Dual Speed Limit support is an integrated feature of the TRIPS Travel Time System, and Time Distance Diagrams are available based on actual traffic data from the SCATS system. This allows coordination and red light delays to be viewed at any time. Coordination Arrows on screen show the actual coordination of traffic based on signal timings. Problems due to incorrect signal offsets are immediately identifiable. TRIPS even allows immediate launch into SCATS to correct any identified problems. 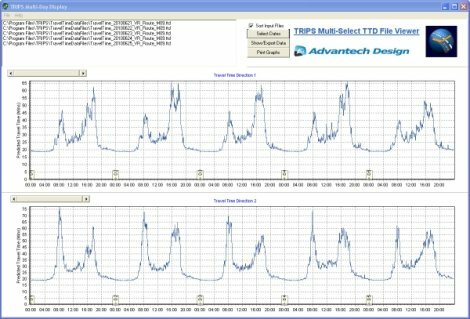 Advantech Design introduces the new TRIPS_Display, a new product that allows multi-day display of route data from TRIPS TTD data files. The product is a separate application, so this allows it to display data independent of TRIPS operation. Print graph functions are also included. It has capacity for display of up to 200 days of data, and allows for exporting of result sets into CSV format for further offline analysis. 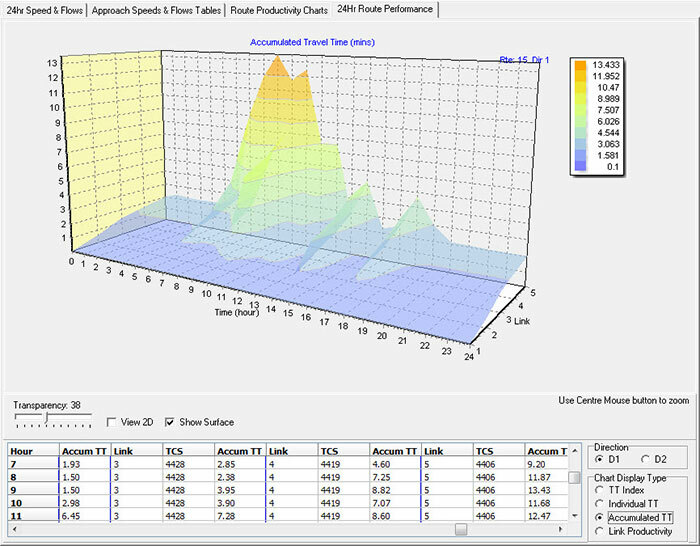 Zoom and Pan features are included, allowing areas of the graph to be magnified and scrolled.